"A doctor told my mother that she had 6 months to one year to live, and my daughter and I decided that we weren’t going to accept that,” says Darleen Mosher, pictured right, regarding her mother’s aortic stenosis. 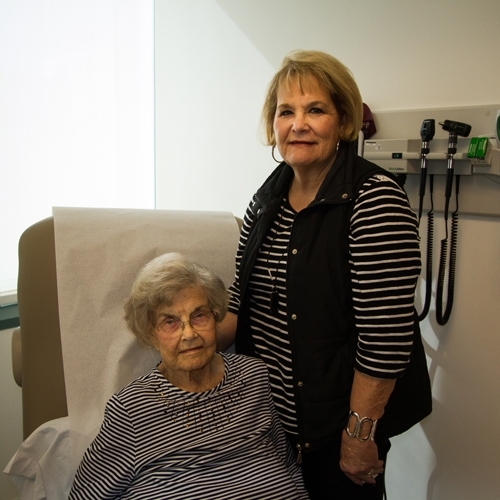 Alta Mauer Claassen, pictured left, needed a valve replacement, as her aortic valve wasn’t properly opening to allow blood flow, so Darleen did her research and came to Ronald Reagan UCLA Medical Center. “My mom had numerous blockages in her heart, so Dr. William Suh put four stints in on one side, one stint in on the other side, and two weeks later we came back and she had the transcatheter aortic valve replacement done. Without TAVR she probably would have died. This product is fabulous. My mother is doing much better. She’s 94 years old and I think she’s going to be more active than she was before."